I don't think boric acid will do much. The first thing I'd do is to tell the landlord about it; I'm concerned about any structural damage that they may be doing. Ultimately he/she would probably want to paint the surface or cover it with metal flashing if replacing it with pressure treated wood. 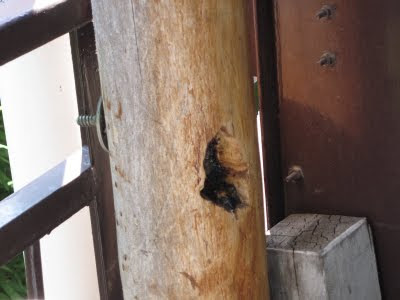 Carpenter bees here generally aren't much of a stinging risk. Using an insecticide is at best a temporary, stop gap measure- more are likely to attack the surface since it seems to be "prime real estate." The safest thing to do is to put on any protective gear and hit the holes with a labeled bee/ wasp killer after first checking to see if it'll mess up the wood surface. I'd do this at night using a flashlight covered by red cellophane (you can get it from report folders). The insects can't see red. Hornets and yellowjackets have been known to fly up the beam of an uncovered flashlight! I'd then blow a pesticide dust up into the holes (not using is mouth!! ), wait a day or two, and then putty the holes. I'm not sure what is registered for bees in Japan, but carbaryl is an effective active ingredient and is sold under various trade names. Hmm...good to know, but there are a few factors in play. The landlord is an old man who isn't in any condition to do anything about the bees. Also, I don't care about the structure or damage of the wood - it's just an old discarded wooden pillar. I guess I'll have to look for an insecticide when I get back. Yeah, right. Kudos to me if I can figure out how to say that in Japanese.